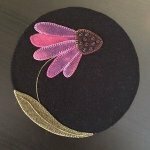 Introductory to wool applique class. Kit includes pattern, wool, thread and needle. Join us and see how fun and easy this strip quilt comes together. Beautiful table runner with happy flowers. Fun project using applique techniques. Make this beautiful quilt top at a 6 hour workshop with Corey Yoder. Cost is $75 and includes the pattern, lunch and a day with Corey Yoder! You will need to purchase the pattern prior to the class, there is some cutting that needs to be completed beforehand. There is a supply list that will be emailed to you upon registration. The fabric is sold separately, the quilt top is made using a jelly roll. This is not a quilt you can get finished in a day. You will be working on the blocks. It will be a wonderful afternoon learning some of Corey's favorite methods!